In a challenging game to set up after the blizzard from Wednesday night, the stadium was plowed and the game between Littleton and Frederick ended with a score of 6-0. The game began with a high pace of speed and the competitive spirit in favor of Littleton High School. The first half let the Lions begin to feel more comfortable and dynamic on the ball which allowed them to play around Frederick girls. The Littleton Lions were dominating every second, with minimal ball possession losses and soon senior Lizzy Hernandez would prove to be dangerous in the attacking third. Hernandez had several attempts on goal, but with no good luck. Several shots that didn’t go in made the crowd loud with excitement. After these several attempts, Lizzy Hernandez set up the scoreboard in favor of the Lions. It wasn’t too long until the Lions would score once more and ended the first half with a score of 2-0. 2-0 scores can be dangerous, so Littleton made sure to come back hard for the beginning of the second half. The technique and the fast passing made greater opportunities for LHS to get near the 18. Frederick struggled to defend. “I think we succeeded in executing a lot of stuff we have been working on at practice like passing, taking multiple touches on the ball and switching the field,” said senior Barrett Small. The few attempts of attack from Frederick were stopped by Lion defenders junior Ellery Tripp and senior Barrett Small. As the Lions continued to attack, 2 more goals were scored. 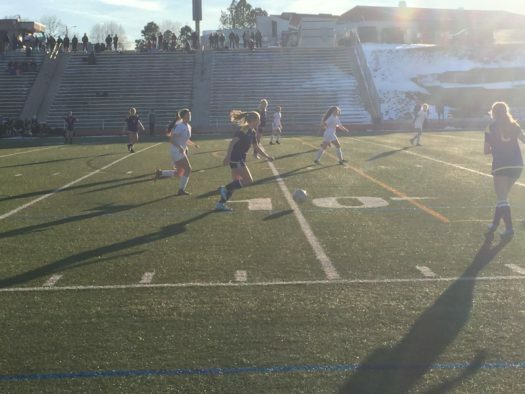 Within the second half, Littleton scored four goals within a matter of about 15-20 minutes. “The win today felt so good. We are a fairly new team with not a lot of returning varsity players but I think we are really starting to understand how we play together which is awesome,” said Small. Littleton kept their intensity high and complete concentration on the game which provided for a successful match in this non-conference game against Frederick High School.